"The conversation about climate change is typically focused on the costs of mitigation, but this paper shows the human toll of policy inaction," said senior author Gregory Wellenius, associate professor of epidemiology in the Brown University School of Public Health. "These results show the cost in terms of human lives due to just this one aspect of climate change: temperature. We have here an opportunity to save lives and improve people's health." The analysis, published in the journal Environment International, is based on a set of internationally accepted temperature models through the decade 2085-2095 and the research team's calculations of present-day temperature-related mortality specific to Atlanta, Boston, Chicago, Dallas, Houston, Los Angeles, Miami, New York, Philadelphia and Washington D.C. The study forecasts deaths due to heat and cold for two different possible futures: A "better case" in which policy and technology mitigate climate change, yielding only a 1.8-degree Celsius increase in average global temperature by 2100, and a "worse case" in which greenhouse emissions continue growing at the current pace, leading to a 3.7-degree Celsius increase globally by 2100. Across all 10 metropolitan areas, assuming no population growth at all, the study forecasts a "worse case" range of mortality averaging 10,300 heat-related deaths a year by 2050 and 26,000 heat-related deaths annually by 2090, compared to only about 2,300 in 1997. In the "better case" the heat-related deaths rise "only" to around 7,700 by 2050 and 10,400 by 2090 from the 1997 baseline. "This paper highlights the importance of both mitigating and adapting to climate change, because what we see is that heat related deaths are going to increase even under the better case scenario," said lead author Kate Weinberger, a postdoctoral researcher in the School of Public Health and the Institute at Brown for Environment and Society (IBES). "We should try to avoid the worse case scenario, but we will still need to protect people from heat, even in the better case." The local temperature projections for each metropolitan area in the study came from the 40 climate models encapsulated in the Coupled Model Intercomparison Project Phase 5 used by the Intergovernmental Panel on Climate Change. The population growth estimates are based on the U.S. Environmental Protection Agency's Integrated Climate and Land-Use project. 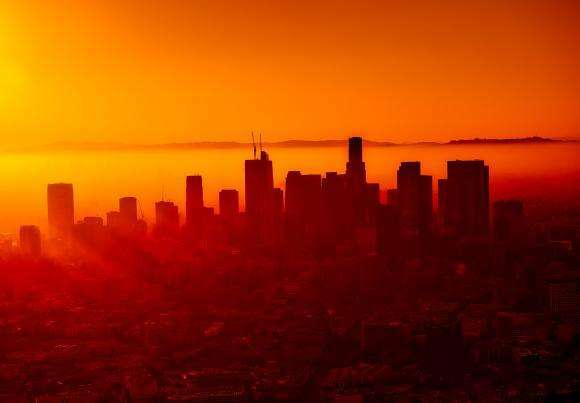 To determine each metropolitan area's propensity for temperature-related deaths, the researchers analyzed the relationship between mean daily temperature and daily mortality between 1986 and 2005. Cold kills FAR more than heat, it always has. In addition, life and diversity of life is always more abundant during Earth's natural warming periods. OK, there's nothing wrong about this article and it's predictions are probably true. But, only for the 10 metro areas they studied. Since the majority of those areas are already warm to begin with the conclusion is rather obvious and misleading. How would deaths from cold vs hot change planet wide? Reduce the Urban Heat Island effect. Paint the roofs and roadways (sky facing surfaces) white. Oh yeah, no one actually wants to do anything that might work. Just transfer wealth from Western Civilization to the rest of the planet (including China, the people's republic of). You can't just paint a road, you'll mess with the coefficient of friction and cause car wrecks. And in northern climes (speaking from a northern hemisphere point of view) dark roofs are necessary for melting snow or quick drying to prevent moss growth. But high albedo road and roof surfaces are worth investigating in some climates. Malaria killed 429,000 people in 2015. Is malaria the diverse life you were referring to? One issue here is that tropical diseases and other horrible ways to die are related to heat but are counted in different categories. Heat kills far more people than cold, and it does it with a much larger variety of methods. Malaria killed 429,000 people in 2015. Is malaria the diverse life you were referring to? Fool. Malaria was endemic in the US and Western Europe through 1951, when it was eradicated by DDT. The disease vector still ranges throughout the northern hemisphere and malaria could easily return to it's former range with no change in temperature, or even in cooling temperatures.